Scientists have found a hellish world where the "surface" of the planet is over 4,000C - almost as hot as our Sun. Being so close means the planet cannot exist for very long - the gases in its atmosphere are being blasted with radiation and lost to space. Researchers say it may look a little like a comet as it circles the star from pole to pole - another strange aspect of this discovery. News of KELT-9b is reported in the journal Nature. Its highly unusual properties were also presented on Monday to the spring meeting of the American Astronomical Society in Austin, Texas. "We found [KELT-9b] back in 2014, if you can believe it; and it took us this long to finally convince ourselves that this truly bizarre and unusual world was in fact a planet orbiting another star," Prof Scott Gaudi, from The Ohio State University, told BBC News. "We know pretty well how big the planet is and how massive it is: it's about three times the mass of Jupiter and twice as big as Jupiter. "We know the parent star's properties reasonably well: it's about two and a half times more massive than the Sun; it's almost twice as hot as the Sun; and it's rotating very rapidly and so it would appear very flattened to our eyes." The planet is tidally locked to its star, meaning it always presents the same face - just as our Moon never shows its far side to Earth. This raises the temperature on the "day side" of KELT-9b to over 4,300C - hotter than the surface of the average Red Dwarf star, by far the most common type of star in the Milky Way. 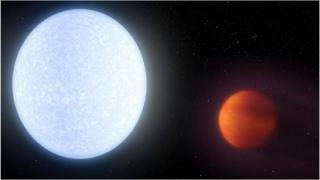 The host star - known by the simple designation of KELT-9 - is radiating so much ultraviolet light that it may completely erode the planet's atmosphere. Prof Gaudi's team calculates material is being lost at a current rate of perhaps 10 billion or 10 trillion grams per second. If KELT-9b possesses a rocky core, this could be laid bare eventually, but a more likely end scenario is that the planet will be engulfed by the star. This star is what's termed an A-type object. These stars burn brilliant but brief lives. They exist for just millions of years rather than the billions of years that our Sun is expected to persist. So it may not be long before KELT-9 puffs up as it exhausts its fuel and eats the planet. The discovery was made using a robotic telescope system that uses high-end - but standard - camera telephoto lenses attached to scientific grade detectors. The Ohio State University operates the system at two locations, one in the northern hemisphere and one in the southern hemisphere. It is a collaboration with Vanderbilt University, Lehigh University, and the South African Astronomical Observatory. This astronomical facility goes by the name of the Kilodegree Extremely Little Telescope. "We named the telescope kind of as a joke; we're poking a little fun at ourselves," said Prof Gaudi.